You might call Adharanand Finn a running anthropologist. His research started with an obsession surrounding Kenyan runners, where he headed over to the African highlands to see how the fastest marathoners anywhere train. The result: 2012’s acclaimed Running with the Kenyans. 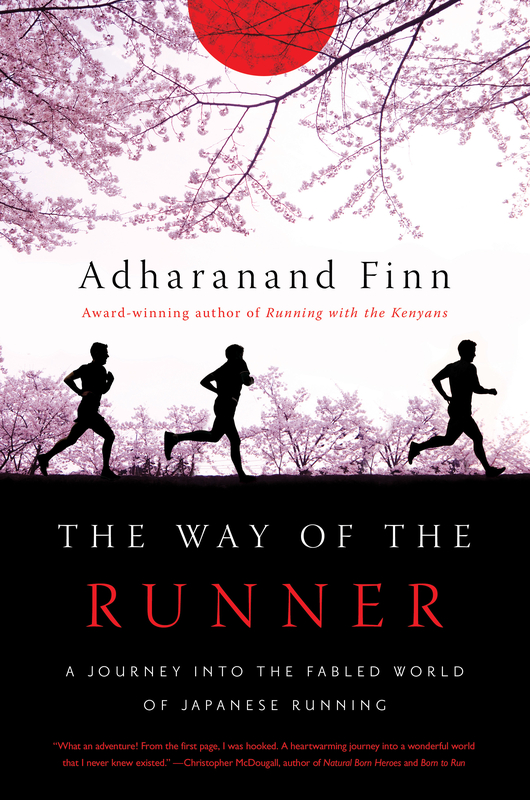 With his new book, The Way of the Runner, Finn looks to Japan, perhaps the most running-obsessed country in the world, where the second biggest televised sporting event is a two-day relay race, and most large corporations sponsor teams that train in-house. Finn spends a year immersing himself in the running culture, uncovering the tight-kept secrets of Japanese running coaches, and explaining why so few of us has ever heard of the prowess of Japanese distance runners. It all stemmed from the first trip I made to the country. My brother got up one morning — as I explain at the beginning of the book — and he says he’s running an ekiden [a long-distance relay race]. So I went to watch, and the whole town comes out and everyone was involved in one way or another — it’s clearly this huge event in this town. Then he told me every town in Japan had one of these. That was years ago, so I’ve just always had that in my mind. When I wrote Running with the Kenyans, which was a huge success, they suggested I go to Ethiopia and write a book about Ethiopia, and I said that’s kind of the same story again — I need something completely different. And my mind just went back to that day when I saw this town all out for the running event, and I started thinking about Japan, and then when I started looking into it, the more and more I discovered, the more and the more amazed I was. And you found that many of these ekiden runners were fast. The times these guys were running… There was one particular race where they had the student university half marathon championships in Japan on the same day that they had the British half marathon championship in England, and the guy who came in hundredth, just in the student championship, he would have won the British championship that day. That’s when I knew something was going on there. It became a journalistic endeavor. It wasn’t like when I went to Kenya, where I had this long childhood obsession with Kenyan running and also wanted to see if I could improve. But in many ways the story is about what Japan is doing wrong. Or at least why they’re not competing on the international stage with, say, Kenyans. They’re mostly doing things right — in terms of performance, elite performances, there’s a lot support, there’s a lot of enthusiasm, there’s a lot of fervor. In Kenya, [distance running] is the number one sport, and in Japan it’s, like, number two after baseball. The more I thought about it, and the more I spoke to different people, the bigger the sense became that it’s only the way they’re doing it that makes them inferior to the Kenyans and the Ethiopians. In essence, they’ve got the raw materials, and the system, but the Japanese don’t care as much about international competition as everybody else. These competitions in Japan are so big, there so popular that they care more about those than winning big international marathons. And that’s not necessarily criticism, there’s not necessarily anything wrong with that, I was just kind of taking this perspective — answering this question of why they’re not running as fast as perhaps they could be. And what about the overtraining you saw? There’s a debate in Japan about overbearing coaches, working people too hard, too young. And the asphalt. That was probably a more direct criticism because it just didn’t make sense to me. They just like everything to be neat, clean, precise, and it’s obviously easier to get that on the concrete, where everything’s marked, everything’s exact, everything’s safe. But in terms of my worldview, and using the Kenyans and the Ethiopians as a benchmark — who won’t run on the concrete, asphalt if they can help it at all — it’s part of why Japan isn’t competing at this level. You talk about a seeming physical inferiority complex from Japanese runners. Is there any truth to it? I mean, the Japanese complain that they’re too short, but actually, there was one particular year recently when someone worked out the average height of the top hundred marathon runners of that year, and it was 5’ 7”, and that’s the average height of a Japanese male. You do need to be short to be a marathon runner. The Kenyan runners are all small, and the Japanese guys are all small. David Epstein, in his book The Sports Gene, has a whole chapter about Kenyan runners, and in the end he pretty much concludes that in this case there is very little, if any, genetic evidence for the superiority of Kenyan runners. I think that the Japanese have got a lot of advantages in some ways. A British runner I spoke to, who lived for ten years in Japan (she’s actually the second fastest marathon runner right behind Paula Radcliffe), the first thing she said was, “Well they have such a natural advantage being so light, and I used to have to struggle to get to the right weight to be ready to race, and that’s just their natural diet — they don’t have to eat special food, they’re just there, and they’re just small, and they’re just perfectly built for running.” So that was her take on it. You say the Hakone Ekiden, a televised two-day distance relay, is one of the country’s biggest sporting events. Really? It was, like, I guess in America, the closest thing is the Super Bowl, where just everybody’s talking about it, it’s unavoidable — it’s just everywhere. You’d have to be living in a cave not to know what was going on. As a runner that’s amazing to see, and it’s great to watch. The runners themselves … you can tell they’re performing out of their skin. In the race I watched, the first 10K, over half the field got to the first 10k of a 22k leg inside their 10k PB [personal best], so they’re already running way beyond themselves. At the same time, they’re breaking all sorts of national records. How does one watch a two-day-long running race? We do have an equivalent in England, which is cricket. It’s something you come and go to, part of the reason that race has become so popular is because it’s holiday time. So it’s over two days, which is the main national holiday in Japan, the New Year holiday, and so everybody is at home, the TV is on, they’ll watch it for half an hour, go out, do something, come back, say, “Oh, what’s happening now.” Maybe there’s a fan in the family who’s watching it all … I don’t think the whole country is fixed on it like you would be with a football match, because, like you say, it goes on for two days. Lots of people, anyone who lives near the route, will come out and cheer, much like the Tour de France. People will come out of their houses, watch it as it goes by, and then go back in and carry on watching on the television. What did you learn about your own running in Japan? People often ask me how my running changed after Kenya, and lots of the key things you learn are things you just can’t replicate. Like the very tough childhood, and the living at altitude, this kind of incredible desire because you’re poor — you can’t replicate that. And the same in Japan, a lot of the things you could see them doing right, in terms of having this very strong team bond, people running together, in groups, which is something that’s common in Japan and Kenya. In terms of my own running, there wasn’t that much directly new that I could actually learn, except to just be inspired to be close to these top runners, you can’t help but feel like you need to up your game a little bit and do what you can.